Removes toxins throughout the body and some viruses quickly. Help mitigate the effects of "Chem Trails"
Some find zetox helpful for reducing mold. ** Insulin-dependent diabetics may discover that Zetox lowers the need for insulin. "I specialize in brain research focusing on medical disorders of the brain. The brain is a fatty tissue organ that quickly collects toxins and heavy metals that we are exposed to on a daily basis. This build up of toxins and heavy metals blocks the good nutrients from getting into the brain for proper brain neurotransmitter functions. This leads to memory loss and many dysfunctions of the brain. This includes issues that people may not even realize are affecting them such as bad sleep patterns, not being alert, bad moods, not being calm and bad behavior." "Zetox can easily be given to children, the elderly and everyone in need. Zetox is an amazing product for proper brain function. I recommend Zetox as a daily detoxifier to all my patients." liquid zeolite product at a much improved price! -- Traps some allergens before they enter the blood stream and digestive tract and before the body can react to them, thus reducing symptoms from allergy. Mold - Some have reported that adding zetox to their daily regime has helped reduce their reactions to mold. Shake and take one dropperful (16 drops) two to three times per day. Do drink lots of water throughout the day, to assist the zetox to flush those toxins out). Diabetics - Please note: This product has been known to reduce glucose levels. You may want to check your numbers after using this product. Has the ability to remove many environmental toxins it comes in contact with such as exhaust and chem trails. HOW TO TAKE: Shake well before using. Optimum to take Zetox on an empty stomach away from food so it can easily and quickly enter the bloodstream; however it will be effective if you don't. One Bottle is approximately a 4 week supply when taking 2 droperfuls per day (about 16 drops = one droperful) and a three week supply when taking 3 dropperfuls per day. Adult Dosage: Usual dosage is one droperful two to three times per day. Three times per day for several months provides for faster detoxification. Check with your doctor for the correct dosage for you. Children take 1/4th to 1/2th the adult dosage. No one product removes every toxin, however combined with the Red Desert Clay, this will cover a broad range of pathogens which accumulate in the body. 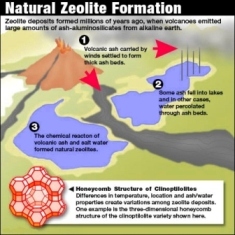 Here is a diagram of the zeolite honeycomb structure as it is formed in nature millions of years ago. What makes zeolite effective for removing toxins is that the majority of the particle sizes are 5 microns in size (similar to the Red Desert clay particles which are typically two to three microns in size). When eaten the zeolite mineral moves between the cells of the body pulling toxins and poisons into its honeycomb structure where they are trapped and held until released out of the body via the urine or bowels, generally 6 hours or so. The zeolite cagelike structure is hollow when it enters the body, and full of toxins when it leaves the body. ZETOX works very well in conjunction with the Red Desert clay as between the two of these products, a broad spectrum of toxins are removed from the body and the immune system can take over. Start with one product and then in the coming days or weeks add in the second product.